I have a habit of starting reviews and never finishing them, so when I am in the middle of a review I am loathe to stop because I am not sure I’ll ever finish. However, I have to make an exception today (don’t worry; I will make sure to finish the other one too…and I did). 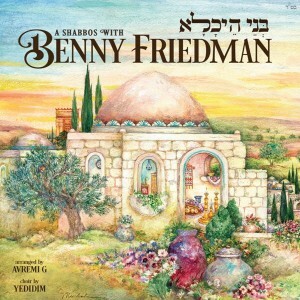 I got the new Bnei Heichala Shabbos album by Benny Friedman and immediately loved it. When that happens I know I have to review the album ASAP. I happen to be on the way to a simcha in Lakewood so I have the time on my flight to plug in, listen and write! I must say that this album is one that will be enjoyed by many for a long time for a few reasons. One, it’s classic Shabbos songs. People might enjoy new songs when they come out, but many get old quickly. When it comes to many of the classic Shabbos zemiros and songs, they seem to be timeless and sung over and over no matter how old they are. I know how hard it was to pick out 30 songs out of literally 100’s of amazing Shabbos songs, but Benny, producers Sruly Meyer and Mendy Werdyger, and arranger par excellence Avremi Gourarie, managed to pick a mix of songs that span the wide array of songs and styles out there and did an amazing job. I also like how Yedidim Choir really blend with Benny’s awesome amazing voice and provide top notch harmonies. Joy is in the air: This is a medley of English songs for “pre” Shabbos enjoyment (aka Erev Shabbos). Starting with an old Yom Tov Erlich song (later rereleased by Avraham Fried) called Shabbos Kodesh (the original Yiddish words were translated into English by Benny’s brother Eli, followed by Shabbos Queen, a favorite song of my girls (I have heard this song sung about 100 times in the past few months so to be able to play it for them was a real treat), a traditional song Shabbos Angels, and finishing with Abie Rottenberg’s classic It’s Time to Say Good Shabbos. I love the arrangements and especially how Avremi sticks in the intro to Just One Shabbos. Welcoming the Queen: This is a medley of songs from Kabalas Shabbos. Starting with an intro of the traditional Lecho Dodi featured on this medley, the music quickly morphs into an upbeat Zug Shoin Lecho Dodi originally by Tzlil V’zemer (for some reason it doesn’t sound familiar but I am not the biggest maven of the later Tzlil V’zemer albums. EDIT: I was told that Zug Shoin is from Tzlil Vzemers first album, Wake Up Yidden and I have never heard of that album either…must be before my time!) [The liner notes on the next 2 songs seem to be out of order so I am following my gut (and ears) and not the notes]. It follows with a Shamor V’Zachor/Lecho Dodi composed by Yerachmiel Ziegler (also a song I am not familiar with) with some killer and crisp horn lines by Avremi G. and a real catchy chorus. The medley continues with a famous traditional Lecho Dodi. I really like how Benny sings with the ha’varat sefardi. To me it sounds natural. The medley ends with a beautiful hartzige Rozo D’Shabbos composed by Benny Hershkowitz and originally performed by Michoel Streicher. It brings back memories for me! My Soul Wants to Sing: This is a medley of Shabbos Evening Zemiros featuring Aishes Chayil and Azamer. The intro is Benny’s famous Shalom Aleichem followed by a Bobover Aishes Chayil. The 2nd Aishes Chayil is the version of Avnei Hakotel/Martin Davidson (talk about spanning the gamut of where the songs are from). Two Chabad versions of Azamer follow, first a slow hartzige version followed by a more upbeat (and famous) version. A Night of Peace and Joy: The Friday night seudah continues with this medley, beginning with Ari Goldwag’s famous and beautiful Koh Ribon (one of the few newer songs to actually make it into the rotation of Shabbos zemiros). The medley continue with a traditional and famous Yom Zeh L’Yisroel, Miami Boys Choir’s Menucha V’Simcha (I love the disco beat on the 2nd part) and ending with Avraham Fried’s Mein Olam Haba (which growing up we used for Lecho Dodi and still to this day one person at the shul my father davens at requests that my brothers or I use that nigun when we come and daven from the amud). The traditional Mein Olam Haba gets thrown in to end of the medley (classic Avremi G….) This medley is one I could listen to all day and night! Singing with the Angels: This is a medley of songs from the Shabbos Morning davening. It begins with David Werdyger’s Hu Elokeinu (complete with the chassidishe havara….Benny is just a natural) and continuing with the Mozditzer Mimkomcha that Mordechai Ben David made famous (how many people have used this over the years during kedusha). The Viznitzer Kevoido and Chabad Hu Elokeinu end of this medley. One thing I really love about this album is how the tempos change within the medleys in order to match the songs of that particular part of Shabbos together. Hashem Truly Loves Us: This is a medley of Shabbos day zemiros which starts with the hauntingly beautiful MBD/Yossi Green classic Chukoiseha and quickly vamps to 3 traditional and famous zemiros: a sephardi Dror Yikrah, Ki Eshmira (not sure what is with the sephardi accent on this…unless it is really a sephardi zemirah), and followed by everyone’s favorite Yom Zeh Mechubad (with everyone’s favorite yeshivishe harmonies included). Mendy Werdyger’s Zeh H’aois is a welcome addition to this medley and the famous Boruch Kayl Elyon originally by Camp Sdei Chemed is a perfect ending to this medley. The arrangements and harmonies on this medley are really top notch…as they are on the whole album! Children of the Palace: This is the title track of the album, a beautiful chabad niggun Bnei Heichala from the zemiros of shalosh seudos. Echos of a Holy Day: Who hasn’t grown up singing Uncle Moishy’s classic Shabbos is Going Away! My kids sing it with my wife every week! I love the child soloist, Benny’s nephew, Yankele Friedman…that family has talent! The medley ends with a Breslover B’motzai Yom Menucha….1st a “live” kumzitz and gradually building up into a classic Avremi G arrangement. All in all, his is one top quality album. Of course anyone can find plenty of his/her favorite zemiros not on the album but this mix of songs is pretty broad (besides for Carlebach songs…but that’s life) and should be an album listened to and enjoyed for many more years to come. If you don’t have it I recommend you buy it at http://www.mostlymusic.com/bnei-heichala-a-shabbos-with-benny-friedman.html or wherever good quality Jewish music is sold.